Energy giant AGL this week unveiled plans to produce hydrogen power at its Loy Yang A coal station. But how do we transform coal, which is often thought of as simply made of carbon, into hydrogen – a completely different element? In fact, coal is not just made of carbon. It also contains other elements, one of which is hydrogen. But to get a lot of hydrogen, the coal needs to be “gasified” rather than burned, creating compounds that can then be reacted with water to make hydrogen. This is where the majority of hydrogen comes from in this case – not from the coal itself. Why is hydrogen fuel making a comeback? What is coal made of? In simple terms, coal is a mixture of two components: carbon-based matter (the decayed remains of prehistoric vegetation) and mineral matter (which comes from the ground from which the coal is dug). The carbon-based matter is composed of five main elements: carbon, hydrogen, oxygen, nitrogen and sulfur. You can think of coal’s formation process as a progression from biomass (newly dead plant matter) to charcoal (almost pure carbon). Over time, the oxygen and some hydrogen are gradually removed, leaving more and more carbon behind. Brown coal thus contains slightly more hydrogen than black coal, although the biggest difference between the two is in their carbon and oxygen contents. We can understand gasification by first understanding combustion. Combustion, or burning, is the complete oxidation of a fuel such as coal, a process that produces heat and carbon dioxide. Carbon dioxide itself cannot be further oxidised, and thus is the non-combustible end product of the burning process. In gasification, however, the coal is not completely oxidised. Instead, the coal is reacted with a compound called a gasification agent. Gasification is endothermic, which means it doesn’t produce heat. Quite the opposite, in fact – it needs heat input to progress. Because the resulting gas is not fully oxidised, that means it can itself be burned as a fuel. So how do we make hydrogen? Now we know the key concepts, let’s start again at the start. To produce hydrogen from coal, the process begins with partial oxidation, which means some air is added to the coal, which generates carbon dioxide gas through traditional combustion. Not enough is added, though, to completely burn the coal – only enough to make some heat for the gasification reaction. The partial oxidation also makes its own gasification agent, carbon dioxide. Carbon dioxide reacts with the rest of the carbon in the coal to form carbon monoxide (this is the endothermic gasification reaction, which needs heat input). No hydrogen yet. Carbon monoxide in the gas stream is now further reacted with steam, generating hydrogen and carbon dioxide. Now we are making some hydrogen. The hydrogen can then be run through an on-site fuel cell to generate high-efficiency electricity, although the plan at Loy Yang A is to pressurise the hydrogen and ship it off to Japan for their Olympic showcase. Brown coals are generally preferred for gasification over black coals for several reasons, which makes the brown coal of Victoria’s Latrobe Valley a good prospect for this process. The main reason is that, because of the high oxygen content of this type of coal, it is less chemically stable and therefore easier to break apart during the gasification reaction. Plus there is a small boost from the hydrogen that is already present in the coal. Hydrogen produced in this way is not a zero-emission fuel. Carbon dioxide is emitted through the combustion and thermal decomposition reactions, and is also a product of the reaction between carbon monoxide and water to make hydrogen and carbon dioxide. So why bother making hydrogen? When hydrogen is used as a fuel, it releases only water as a byproduct. This makes it a zero-emission clean fuel, at least at the point of use. Producing hydrogen from coal in a large, central facility means pollution control can be put in place. Particulates, and potentially carbon dioxide, can be removed from the gas stream very efficiently. This is not possible on a small scale, such as hanging off the back of your car. Road transport currently emits dangerous levels of pollutants in our cities every day. Gasification processes that use hydrogen fuel cells on site can substantially increase their efficiency compared with traditional coal-fired power. However, depending on the end-use of the hydrogen, and subsequent transport processes, you might be better off in terms of energy output, or efficiency (and therefore carbon emissions), just straight-up burning the coal to make electricity. But by using gasification of coal to make hydrogen, we can start building much-needed infrastructure and developing consumer markets (that is, hydrogen fuel cell vehicles) for a truly clean future fuel. I predict that hydrogen power will be zero-emission one day. It can be made in a variety of ways through pure water splitting (including electrolysis, or through solar thermochemical and photoelectrochemical technologies, to name a few). It’s not there yet in terms of price or practicality, but it is certainly on its way. Boosting development of the hydrogen economy through production from coal in the meantime is, in my book, not a terrible idea overall. As Australia’s energy debate heats up, some politicians are calling for cleaner and more efficient coal power stations to reduce greenhouse gas emissions. Energy Minister Josh Frydenberg told ABC radio on Tuesday that “ultra-supercritical coal-fired power plants actually drive down the carbon footprint by up to 40%”. And last week Resources Minister Matt Canavan referenced a report, as yet not released by the Department of Industry, Innovation and Science, which claims that Australia can meet its carbon emission targets by replacing existing coal generators with ultra-supercritical coal generation. So, is this a reasonable strategy to reduce Australia’s emissions? Australia’s coal generation fleet is ageing and needs replacing. Two-thirds of the 25 gigawatts in operation (after Victoria’s Hazelwood power station is retired this year) is more than 30 years old, according to ACIL Allen’s generator report. By 2025 a further 18% of the fleet will be more than 30 years old. That means that in 2025 a mere 4GW of our existing coal power will still be considered adequately efficient. This is important because efficient generation affects not only how much generators are paying for fuel, but also carbon dioxide (CO₂) emissions. Modern coal power plants feed pulverised coal into a boiler to combust. Tubes in the boiler walls then absorb the heat and the steam generated in these boiler tubes turns the steam turbine and generates electricity. The difference between subcritical, supercritical and ultra-supercritical boilers is in the steam conditions created in the boiler. Supercritical and ultra-supercritical boilers are often referred to as high-efficiency, low-emissions technologies. Ultra-supercritical power stations are designed to operate at higher steam temperature and pressure. This improves efficiency, and has been made possible by new materials that can cope with higher temperatures. Ultra-supercritical coal power stations operate under steam conditions above 593-621℃ and 28.4 million pascals (a measure of pressure). You can find further detail in this report. Using higher temperatures means greater efficiency, producing more electricity using less coal. Australia’s most efficient coal power station, Kogan Creek, is able to convert 37.5% of the gross energy, or calorific value, of coal into electricity. Hazelwood converts only 22%. The remaining energy is lost as heat. By comparison, ultra-supercritical coal stations are able to convert up to 45% of the gross energy of coal to electricity. Advanced ultra-supercritical coal generation is expected to convert over 50% of the gross energy of coal to electricity, but the expensive alloys required to accommodate the very high temperature requirements make the plants very expensive. Before advanced ultra-supercritical coal plants can be deployed, new design changes like this will first need to be tested and evaluated in pilot implementations. Reducing fuel use reduces emissions. Hazelwood’s reported CO₂ emission intensity from 2014-15 was 1,400kg of greenhouse gas for every megawatt-hour of electricity it produced. Kogan Creek emitted 831kg per megawatt-hour. The greater efficiency of ultra-supercritical generators can reduce emissions intensity to 760kg per megawatt-hour for black coal. Advanced ultra-supercritical generators can reduce emissions even further. Upgrading or replacing Victoria’s brown coal generators to ultra-supercritical would reduce emissions intensity to 928kg per megawatt-hour. So greenhouse gas emissions can be reduced if ultra-supercritical generators replaced Australia’s old, inefficient coal generators. The problem is just how much CO₂ emissions can be reduced. Emissions from coal power are the largest contributors to Australia’s total emissions. Let’s assume the current fleet of power stations is operating at 80% capacity, considered to be an economic optimum for coal power. This would generate 176 gigawatt-hours of electricity and 165 million tonnes of emissions. This allows for a 14% increase in consumption of electricity by 2030, which is likely given projections of population and economic growth. If we then replace the entire 25GW, both black and brown, with ultra-supercritical generation, according to the assumptions included in the Australian Power Generation Technology Report, emissions would total 139 million tonnes. This would represent a 16% reduction in coal emissions, but a mere 5% reduction in Australia’s total emissions in 2013-4. And then we would have those ultra-supercritical power stations for the next 30-40 years, incapable of reducing our emissions further as global targets tighten. If Australia were to wait until advanced ultra-supercritical coal power is tested and trialled, then we could speculate that emissions from coal generation could reduce by a further 10% to 124 million tonnes. This would be a more promising 25% reduction in coal emissions, but still only a 7.7% reduction in Australia’s total emissions. Australia’s emission reduction target for 2030 is 26-28% below 2005 levels. Emissions in 2005 were 594 million tonnes. Australia’s climate target would require emissions to reach around 434 million tonnes in 2030, a reduction of 160 million tonnes. If coal power stations were to reduce emissions by 26-40 million tonnes through a shift to ultra-supercritical generators, then Australia would still be a very long way from meeting its committed targets. The only way shifting to ultra-supercritical coal power could meet Australia’s 26-28% climate target is if carbon capture and storage (CCS) were applied. Ultra-supercritical coal plants are expected to generate electricity at A$80 per megawatt-hour, according to the Australian Power Generation Technology Report. This is 45% more expensive than the average wholesale cost of electricity for 2015-16. If CCS is added, then the projected cost swells to A$155 per megawatt-hour, nearly three times last year’s wholesale cost of electricity. These costs eventually get passed on to electricity bills, and it’s unlikely that consumers will be willing to see electricity prices rise that much. Until we see more detail underpinning the current enthusiasm for “clean coal”, we’ll have to speculate on the assumptions of the report referenced by minister Canavan. Replacing old coal power stations with new “ultra-supercritical” stations could help meet Australia’s greenhouse gas targets, according to research commissioned by Resources Minister Matt Canavan. Other analysts have reacted with scepticism. Coal has an important role to play as Australia and the rest of the world reduce carbon dioxide emissions… Australia has the resources to be a low-cost and efficient energy superpower. Access to affordable and reliable power underpins our economy and is the key to long-term jobs in the manufacturing sector. This is not the first time Canavan has put his weight behind increasing Australia’s coal production to “help the environment”. But technological promises and government support for coal’s bright future stretch back almost 40 years, long before the election of Tony “coal is good for humanity” Abbott, and have been entirely bipartisan, as have claims that Australian coal is especially clean. Coal’s contribution to the greenhouse effect is small… Means of controlling C0₂ emissions from coal-fired plant are considered best achieved by improved overall operating efficiency using new technology, rather than by endeavouring to capture C0₂ emissions. Fortunately we use mostly – but not entirely – the cleanest coal in the world. But that doesn’t mean we can’t improve the technology and so limit how much carbon dioxide is blown up the spout. The same year the visiting president of the US National Coal Association told a government committee that, while much of the low-emissions technology was still in the laboratory stage, he was confident it could be applied soon to plants using coal to produce energy. In 1991 Australian government funds supported an international conference on clean coal in Sydney. After Australia’s first climate policy, the National Greenhouse Response Strategy, was agreed in December 1992, it quickly became clear that the Commonwealth was not going to stand in the way of state-level support for new coal-power stations. On March 21 1994, the UN Framework Convention on Climate Change became international law. Coincidentally, Singleton Council in New South Wales approved a new coal-fired power station. Greenpeace launched a legal challenge, but this failed in November 1994. The State Electricity Commission of Victoria’s greenhouse reduction plans died with privatisation. It is debatable, but Labor perhaps had more concern – for both climate change and coalminers’ jobs – than the incoming Howard government. The Prime Minister’s Science Engineering and Innovation Council in 1999 suggested Australia ratify the Kyoto Protocol and see it as an opportunity and spur to new technologies. This fell on John Howard’s deaf ears, but a December 2002 report, chaired by Rio Tinto’s chief technologist and government chief scientist Robin Batterham, was taken up, and the enthusiasm for carbon capture and storage (CCS) was born. A COAL21 plan followed in 2004, and the Australian Coal Association Low Emissions Technologies group was formed. Howard’s enthusiasm for coal over renewables was such that he even called a “secret” meeting of fossil fuel producers to advise on lower emissions technologies. The 2004 Energy White Paper continued the trend in support for CCS over renewables. Labor’s innovation in 2007 was to say yes to both. As opposition leader, Kevin Rudd announced he would bring in a National Clean Coal Centre. Had the Coalition won the 2007 election, it would have removed the Renewable Energy Target and replaced it with a scheme that would have allowed coal-with-CCS to be considered “low carbon”. In 2008 the coal association spruiked “NewGenCoal” in television adverts. It all started to go wrong in 2009, shortly after the launch of the expensive and controversial Global Carbon Capture and Storage Institute, Rudd’s brainchild. The reality is, you are not going to see another coal-fired power station built in Australia. That’s, that’s a simple fact. You can talk about all the stuff you like about carbon capture storage, that concept will not materialise for 20 years, and probably never. Geology intervened as the Queensland ZeroGen project ended in late 2010, when the state government decided to stop throwing taxpayers’ money at it. And in 2013 it emerged that the coal association’s funding for low-emissions technologies had been broadened to include “promoting the use of coal”. While there is now a functioning CCS plant in Canada, in Australia CCS limps on and the sums involved now are pitifully small. Three concepts from the study of technological innovation may help us understand what is going on. The first is the “hype cycle” – the observation that initial unrealistic enthusiasm for a shiny new technology goes up like a rocket and down like a stick, followed by a more gradual, tempered enthusiasm over time (for a recent appraisal see here). The second is the sailing ship effect. When challenged by steamships, the incumbent technology added more sails, automated sailors and so on, trying to keep up. But ultimately it was in vain – a new technology won out. Thirdly, supporters of incumbent technologies highlight teething problems in the challenger technologies, in what academics call “discursive battles”. It’s fair to guess three things. Promises of clean coal, high-efficiency, low-emissions (HELE) coal power and bio-energy carbon capture and storage(BECCS) will escalate, but perhaps learning from the public mockery of the last two efforts – Australians for Coal and Little Black Rock. Protests, by people who agree with James Hansen’s 2009 assessment that coal-fired power stations are death factories, will continue. Legal challenges will escalate. Governments – state and federal – will keep wrestling with the greased pig that is the “energy trilemma”. 2017 will be bloody, and noisy. The Victorian Labor government has announced an “ambitious and achievable” Victorian Renewable Energy Target (VRET). This target will commit the state to generating 25% of its electricity from renewable energy by 2020, and 40% by 2025. While details of the VRET are yet to be fully fleshed out, it is set to be based on a similar mechanism to the scheme used in the Australian Capital Territory (ACT), which has managed to sidestep the uncertainty that has plagued the renewables industry in recent years. The ACT deputy chief minister, Simon Corbell, called Victoria’s announcement on Wednesday “a game-changer”. In fact a key motivation identified by the Victorian energy minister, Lily D’Ambrosio, was “restoring the confidence needed to invest”. The federal Renewable Energy Target (RET) was reduced by 20% following the Warburton Review in 2014. Since then, state and territory governments have announced their own targets to support the industry. Earlier this year, the ACT announced it would bring forward previous commitments. It is now aiming to meet 100% of its electricity needs by 2020. In 2014, South Australia announced a 50% target by 2025. More recently, Queensland committed to generating 50% of its energy from renewable sources by 2030. Based on forecasting by the Australian Electricity Market Operator, these commitments add up to a considerable expansion of renewable energy. In total, these commitments represent 56 terawatt hours (TWh) each year, above baseline generation. Baseline generation is renewable generation that existed before 1997, almost exclusively hydro power. The remaining states already have renewable generation and these facilities presumably won’t be torn down. So even assuming that these states don’t build a single new project, in combination with the targets, Australia is headed towards a total of 61TWh above the baseline. This compares to the current national target of 33TWh. 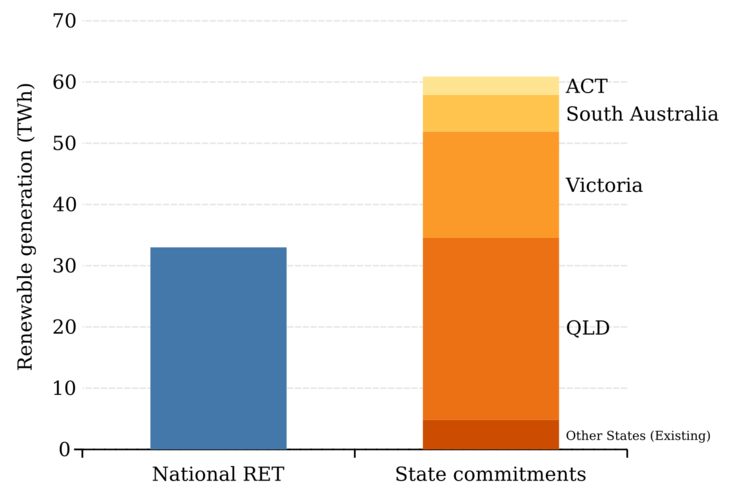 If the states fulfil their commitments, they will deliver almost twice as much renewable generation as the national RET requires. If we add baseline hydro back into the equation, total renewable energy generation in Australia is set to be at least 77TWh by 2030. Depending on how electricity demand changes, and how rooftop solar is included, Australia is on track to meet 30-35% of its power demand from renewables by 2030. What does the target mean for coal? Victoria has always been a major exporter of electricity in the National Electricity Market. In 2014-15, it generated more than 55TWh of electricity and exported over 8TWh. Generally, Victoria exports to South Australia, New South Wales and Tasmania (although Tasmania’s flows have been more interesting in recent times). It is unlikely that Victoria will substantially increase exports. Indeed, it has limited ability to do so. 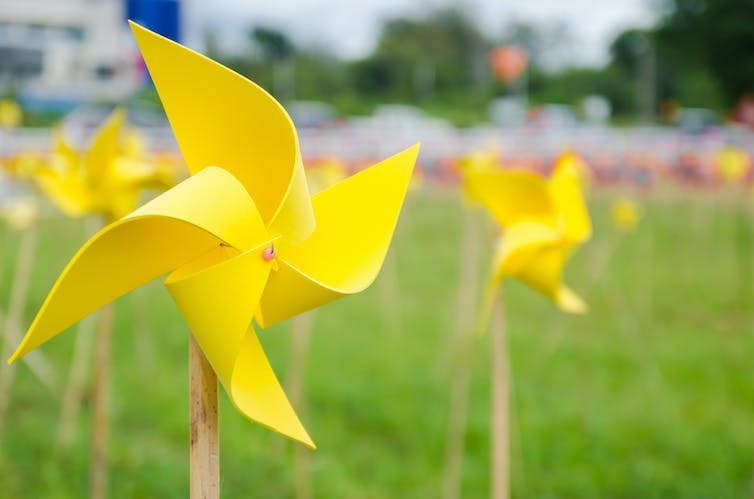 The South Australian government recently announced funding for a study into new interconnection for South Australia to import power when required, and export more renewable energy to other markets. Consequently, such a significant increase in renewable generation in Victoria – expected to be in the vicinity of 5,400 megawatts – will have dramatic implications for the state’s existing power stations. An increase in market share of renewables, from roughly 14% today to 40% in 2025, will necessarily come at the expense of market share for existing power stations. And in Victoria that means brown coal, Australia’s most carbon-intensive power source. The question now is can the brown coal generators collectively survive such a reduction in market share? And if they can’t, who drops out, and when? Or perhaps brown coal can be progressively phased out without too much pain. This is, however, good news for Australia’s national climate change mitigation commitments. At average Victorian emissions intensity, by the time the 2025 Victorian target is fulfilled, the new renewable generation in Victoria would be avoiding the emission of some 18 million tonnes of CO₂ per year. At the national level, several different policies and pathways have emerged through the election campaign. These includes a national 50% renewable energy target, an emissions trading scheme, a brown coal exit plan and potential modifications to the government’s cap on emissions (known as the safeguard mechanism). Whatever emerges at the federal level, the Victorian scheme is well adapted to future changes to both the energy market and energy policy developments. Indeed, it is expressly designed to complement national schemes in the long term, and to provide certainty and confidence for investors in the short term. In response to the VRET, the Business Council of Australia has called for climate policies that are “integrated with broader energy policy”. A decade of policy uncertainty and toxic political debate has thus far prevented this from occurring. Given the popular support for renewable energy, perhaps this policy is actually such a pragmatic approach. Global climate change, driven by human emissions of greenhouse gases, is already affecting the planet, with more heatwaves, droughts, wildfires and floods, and accelerating sea-level rise. Devastating impacts on our environment, health, social justice, food production, coastal city infrastructure and economies cannot be avoided if we maintain a slow and steady transition to a zero-carbon society. According to Stefan Rahmstorf, Head of Earth System Analysis at the Potsdam Institute for Climate Impact Research, we need an emergency response. A big part of this response needs to be transforming the energy sector, the principal contributor to global warming in Australia and many other developed countries. Many groups have put forward ideas to transition the energy sector away from carbon. But what are the key ingredients? At first glance the solution appears straightforward. Most of the technologies and skills we need – renewable energy, energy efficiency, a new transmission line, railways, cycleways, urban design – are commercially available and affordable. In theory these could be scaled up rapidly. But in practice there are several big, non-technical barriers. These include politics dominated by vested interests, culture, and institutions (organisational structures, laws, and regulations). Vested interests include the fossil fuel industry, electricity sector, aluminium smelting, concrete, steel and motor vehicles. Governments that receive taxation revenue and political donations from vested interests are reluctant to act effectively. To overcome this barrier, we need strong and growing pressure from the climate action movement. There are numerous examples of nonviolent social change movements the climate movement can learn from. Examples include the Indian freedom struggle led by Gandhi; the African-American civil rights movement led by Martin Luther King Jr; the Philippine People Power Revolution; and the unsuccessful Burmese uprising of 1988-90. Several authors, including Australian climate scientist Matthew England, point out that nations made rapid socio-economic changes during wartime and that such an approach could be relevant to rapid climate mitigation. UNSW PhD candidate Laurence Delina has investigated the rapid, large, socio-economic changes made by several countries just before and during World War 2. He found that we can learn from wartime experience in changing the labour force and finance. Governments may need extraordinary emergency powers to implement rapid mitigation, but these are unlikely to be invoked unless there is support from a large majority of the electorate. While such support is almost guaranteed when a country is engaged in a defensive war, it seems unlikely for climate action in countries with powerful vested interests in greenhouse gas emissions. Vested interests and genuinely concerned people will exert pressure on governments to direct their policies and resources predominantly towards adaptation measures such as sea walls, and dangerous quick fixes such as geoengineering. While adaptation must not be neglected, mitigation, especially by transforming the energy sector, should be primary. Unfortunately it’s much easier to make war than to address the global climate crisis rapidly and effectively. Indeed many governments of “democratic” countries, including Australia, make war without parliamentary approval. According to Climate Action Tracker, the 158 climate pledges submitted to the United Nations by December 8 2015 would result in around 2.7℃ of warming in 2100 – and that’s provided that all governments meet their pledge. Nevertheless, inspiring case studies from individual countries, states and cities could lead the way to a better global outcome. Iceland, with its huge hydroelectric and geothermal resources, already has 100% renewable electricity and 87% renewable heat. Denmark, with no hydro, is on track to achieve its target of 100% renewable electricity and heat by 2035. Germany, with modest hydro, is heading for at least 80% renewable electricity by 2050, but is behind with its renewable heat and transport programs. It’s easier for small regions to reach 100% renewable electricity, provided that they trade electricity with their neighbours. The north German states of Mecklenburg-Vorpommern and Schleswig-Holstein are generating more than 100% net of their electricity from renewables. The Australian Capital Territory is on track to achieve its 100% renewable electricity target by 2020. There are also many towns and cities on programs towards the 100% goal. If the climate action movement can build its strength and influence, it may be possible for the state of Tasmania to achieve 100% renewable energy (electricity, heat and transport) and for South Australia to reach 100% renewable electricity, both within a decade. But the eastern mainland states, which depend heavily on coal for electricity, will need to build new renewable energy manufacturing industries and to train a labour force that includes many more highly trained engineers, electricians, systems designers, IT specialists and plumbers, among others. Changes will be needed to the National Electricity Market rules, or at least to rewrite the National Electricity Objective to highlight renewable energy, a slow task that must obtain the agreement of federal, state and territory governments. Australia has the advantage of huge renewable energy resources, sufficient to create a substantial export industry, but the disadvantage of a declining manufacturing sector. There are already substantial job opportunities in renewable energy, both globally and in Australia. These can be further expanded by manufacturing components of the technologies, especially those that are expensive to ship between continents, such as large wind turbine blades, bulk insulation and big mirrors. Transport will take longer to transform than electricity generation and heat. Electric vehicle manufacturing is in the early stage of expansion and rail transport infrastructure cannot be built overnight, especially in car-dependent cities. For air transport and long-distance road transport, the only short-term solution is biofuels, which have environmental and resource constraints. The timescale for the transition to 100% renewable energy – electricity, heat and transport – depends on each country or region and the commitment of its governments. Scenario studies (see also here), while valuable for exploring technological strategies for change, are not predictions. Their results depend upon assumptions about the non-technical strategies I have discussed. They cannot predict the timing of changes. Governments need to agree on a strategy for transitioning that focuses not just on the energy sector, but includes industry, technology, labour, financial institutions, governance and the community. Everyone should be included in developing this process, apart from dyed-in-the-wool vested interests. This process could draw upon the strengths of the former Ecologically Sustainable Development process while avoiding its shortcomings. The task is by no means easy. What we need is a strategic plan and to implement it rapidly.